As Rick Johnston wrote for comic industry site Bleeding Cool, we're putting up the "Batspoiler signal" on this one. 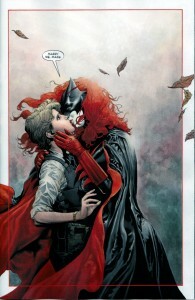 DC Comics has a surprise twist in store for the latest issue of their "Batwoman" comic: A gay marriage proposal. In addition to a "massive conclusion to the current storyline as Batwoman and Wonder Woman struggle to defeat Medusa and a horde of villains," readers will also see Batwoman pop the question to her longtime secret love, captain Maggie Sawyer. Sawyer once served on the supernatural task force with Superman, but was transfered to Gotham City to head their Major Crimes Unit. Oh, and have a tortured but super hot relationship with Batwoman! DC Comics has been making a serious -- if imperfect -- effort at diversifying their super squad with reboots of various characters, Batwoman being just one. And while the possibility of Kate (Batwoman's real identity -- don't tell anyone I told you) and Maggie's nuptials is a pretty natural part of their storyline, it also probably doesn't hurt for DC to get a little good press on gay rights. The company has been taking heat over their decision to hire anti-gay activist Orson Scott Card to pen a digital reboot of the "Superman" series. Card, who doesn't want Batwoman to have a little happiness after all of that crime fighting! DC Comics has resisted calls to ditch the "Ender's Game" author, saying in a statement to Wired Magazine, “As content creators we steadfastly support freedom of expression. However, the personal views of individuals associated with DC Comics are just that — personal views — and not those of the company itself.” But gay rights groups continue to apply pressure, arguing that if DC Comics truly supports diversity, then they shouldn't employ an author (no matter how once-talented he was) who uses his voice and his vote to deprive people of their rights.